Your Next Stamp DT Feature Day-Animal Antics! Hello! It's time for the YNS Feature Day and the theme is Animal Antics! So I had this little lady colored up and I asked my husband if a ladybug would be considered an animal and he said no. Well we looked it up and insects are actually part of the animal kingdom soooooo adorable ladybug it is! The ladybug and sentiment are from the set Bugs and Kisses. I colored her up with Copic markers and cut her out with the coordinating Bugs and Kisses Die Set. I layered her over some grass cut with the YNS Stitched Grass Die and a flower cut with a Taylored Expressions Die out of some dp from the YNS Hugs and Kisses 6x6 Paper Pack. 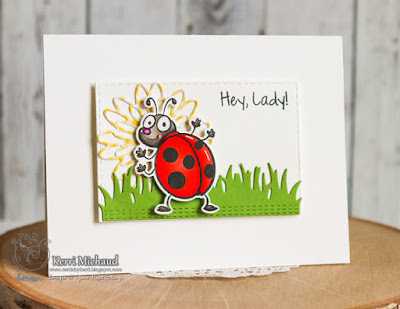 You can see all of the DT's fun cards on the Your Next Stamp Blog and make sure you leave a comment while you're there for a chance to win a FREE Stamp Set of Choice!!! Your card is super duper adorable! Love the design and your colouring is fantastic! Love the lady bug too! This little character is just way too funny!